Generally, street photography is considered to depend in a large measure on the subject and on the moment of the capture. The famous “decisive moment” approach of Henri Cartier-Bresson is something I’m sure everyone knows about. 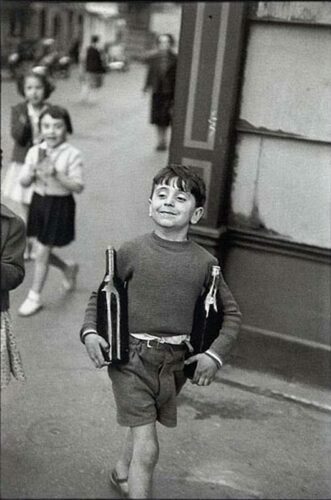 One of the best examples of this approach is the iconic photo below – Rue Mouffetard, Paris, 1954 (Boy with Bottles). Henri Cartier-Bresson is one of the photographers I admire and respect immensely for his talent, knowledge, sharp mind and eye, for his approach to photography and the ability to interpret a scene, to compose, to find relations among the objects in his frames. In a word, he was a genius of photography and I don’t say this lightly. In my opinion, he is one of the reasons photography looks like it looks today, and that we would be much poorer in knowledge and awareness about what photography means if not for him. Maybe one of the reasons he had such a great contribution to photography is because he looked at it in a different way. He had an artistic background and used this knowledge in feeling and interpreting the scenes he photographed, he had an ability to understand the geometry of a scene and knew how to “design” an image and how to blend everything together to create surprise and emotion. It was not only his talent, but also the fact that he looked at photography in a different way, from the prism of his artistic knowledge. This is in my opinion what makes his photography so special and personal, the fact that he used his personal tools and sensitivity in creating it and didn’t rely only on tools he took from outside. Going a step further from this approach, and true to my idea about what photography is, what fine art photography is, especially black and white photography, what I explain in my book From Basics to Fine Art – Black and White Photography – Architecture and Beyond and in my video tutorial and eBook Long Exposure, Architecture, Fine Art Photography – Creating (en)Visionography, when I present (en)Visionography – The New Fine Art Photography, by extension I consider that a photograph, even a street photograph can rely on more than just the scene and the object-subject, it can go beyond the “decisive moment” and it can transform all these and adapt them to the vision and sensitivity of the artist, not only through the way we capture the scene but also through how we process it. We can say that the “decisive moment” can be seen as a “decisive interpretation” of the scene and subject, an interpretation that adds new elements to the story and transforms it to suit the personal interpretation of the artist. As a parenthesis, those who read my book From Basics to Fine Art I just mentioned, also know about my concept of “Architectural Street Photography”, another style related to classical street photography, a style that focuses on the relation of the human subjects of the photograph with the built environment that surrounds them, a style based on geometry and showing unexpected interdependent relations between the two. There is a special chapter in the book about this style and how to create architectural street photography. Fine Art Street Photography is not only about the subject, it is not only about the scene, not only about the moment and about how to combine all these to create a compelling image that will tell a story. Fine Art Street Photography goes beyond this and interprets the scene, it adapts it through not only capturing the image but also through the way it is processed, it adapts it to the vision and intention of the artist. Seen like this street photography can give us a totally new way of interpretation, much more freedom and allow us to add a personal touch to the story. Just like in the case of (en)Visionography, Fine Art Street Photography uses reality as a canvas and it interprets and presents it in a new way, in a personal way, in a way that is born deep inside the artist and it shows his/her view over the world and a personal interpretation of it. Coming back now to what I was saying about why Henri Cartier-Bresson managed to create such a personal and specific style in street photography, which in my opinion is due, except for his talent to looking at photography in a new way, through the prism of his personal artistic tools, this is exactly what creates a fine art street photograph – using personal tools and interpretations in creating a street photograph, relying on our background and experience to create, to interpret and not only to record. In my opinion, one takes a street photograph, but one creates a fine art street photograph. A small difference in words, a big difference in meaning and approach. I will write more about Fine Art Street Photography very soon and I am working on a series of fine art street photographs, so you will see more of this style in the future. Very soon I will publish the tutorial “making of” of my new fine art architectural image Urban Saga, a long exposure image shot in Chicago and the first image of a new series I have shot in the most fascinating cities of the world, showing their best views and what moved me most when shooting these cities. 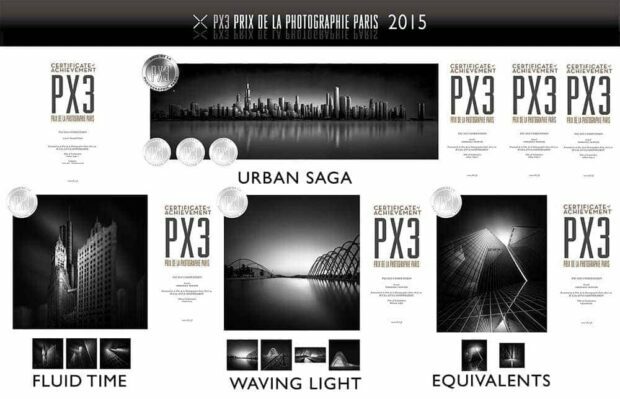 Urban Saga I is a sill unpublished image, but it already won a series of high distinctions at PX3 2015 Awards – Prix de la Photographie Paris, among which a SILVER MEDAL in the category “Fine Art Architecture”, that I am very proud of. This image will also be included in a new book I am preparing with a high-end publishing house (more details on this soon). Here is the first taste of this image in a panel presenting my awards at PX3 Awards 2015. 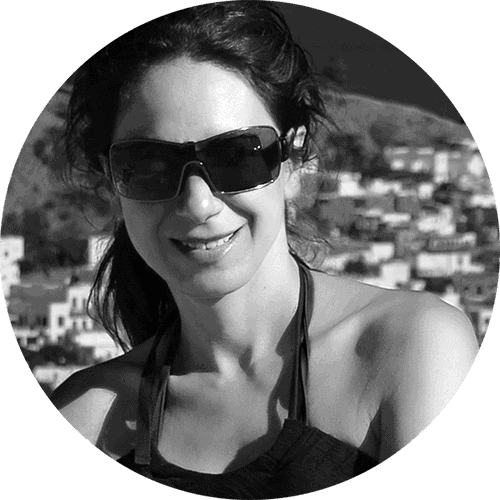 Also, I am working on a new blog post, a more theoretical one, based on your questions, that I’m sure you will find very interesting. If you don’t want to miss all these subscribe at this link to receiving my future blog post. LENS: Canon Tilt-Shift 17mm f/4 – half-shifted downwards – Yes, the tilt-shift lens is fit for street photography too. – LR5, PS CC , Topaz B&W Effects (B&W Effects extensive review) +Topaz DeNoise + Topaz Detail + DxO View Point + DxO FilmPack. Posted in Fine Art Street Photography, Inspiration Creativity, Most Popular, Tutorials Fine Art Black and White Photography. RSS 2.0 feed.